The weather took a sharp turn here this week, with temps dropping into the 30’s overnight and 50’s in the day. It’s gorgeous, this crisp fall weather. It’s also that perfect time of the season where the last of the delicious garden tomatoes are at their peak and you just want to use them in everything before the frost comes and it’s too late. 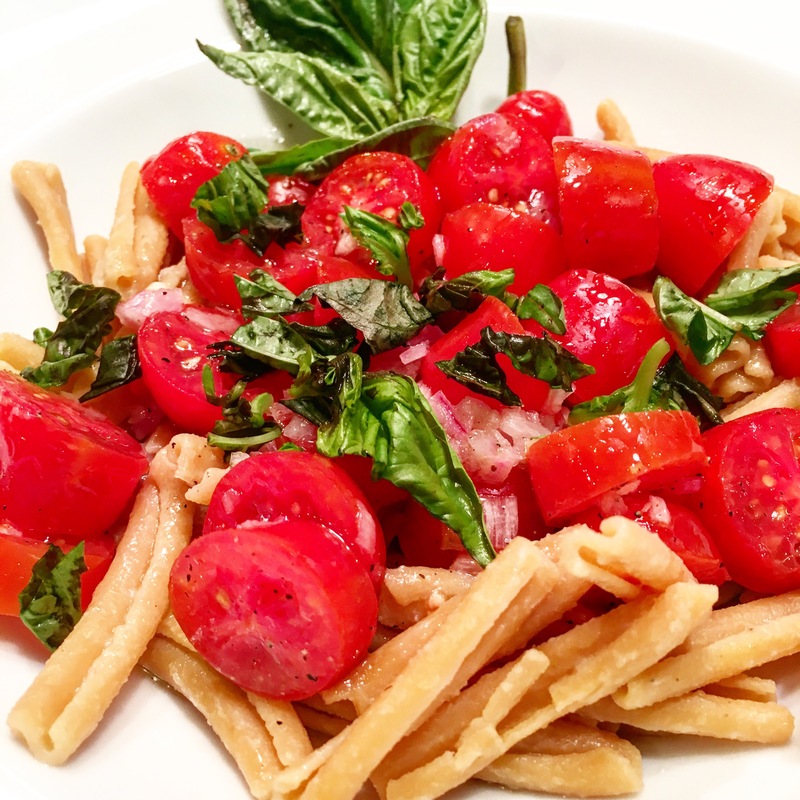 Late summer/early fall tomatoes are perfect on pasta, I think. We love pasta in our house. We eat it about once a week, always with different variations of sauces. Over the years I’ve migrated from making white flour pasta to whole wheat to quinoa/brown rice blend. Recently I’ve started experimenting with legume pasta. I love that it is made with *only one ingredient*. In addition, legume pasta is high in protein and fiber. It’s also gluten-free, vegan, and in the case of Pasta Lensi, also Non-GMO Project Verified. Pasta Lensi, an authentic Italian pasta company, has been around since 1920. And just this September they launched their line of legume pastas. They sent me three flavors to try, which is fun because I really enjoy trying new things (ask any of my friends, they are constantly hearing me talk about something new I’ve discovered). Sadly, while preparing dinner I realized my mozzarella had gone bad in the fridge. What I didn’t know is that the Chickpea Casarecce would impart a creaminess to the dish, which compensated for the lack of cheese quite nicely. I love that it has 22 grams of protein per 3.5 oz serving. The high protein content easily made up for the lack of cheese or meat in the dish. It also has 12 grams of fiber, which is just about 1/2 of an adult’s fiber needs for the day. Dinner was favorably received by my family, and for that I am always grateful. My 11 year old gladly ate her whole bowlful. Here’s the recipe so you can try it at home. Whisk the olive oil, lemon juice, shallot and garlic in a medium bowl. Season to taste with salt and pepper. Gently stir in the tomatoes. Let sit for at least 15 minutes so that the flavors combine. In the meantime, bring a large pot of salted water to a boil. Add the pasta and cook as the label directs. (This pasta, like all the legume pastas I’ve tried, creates a foamy layer on the top of the water. Make sure to use a pot bigger than you need and watch so it doesn’t boil over.) 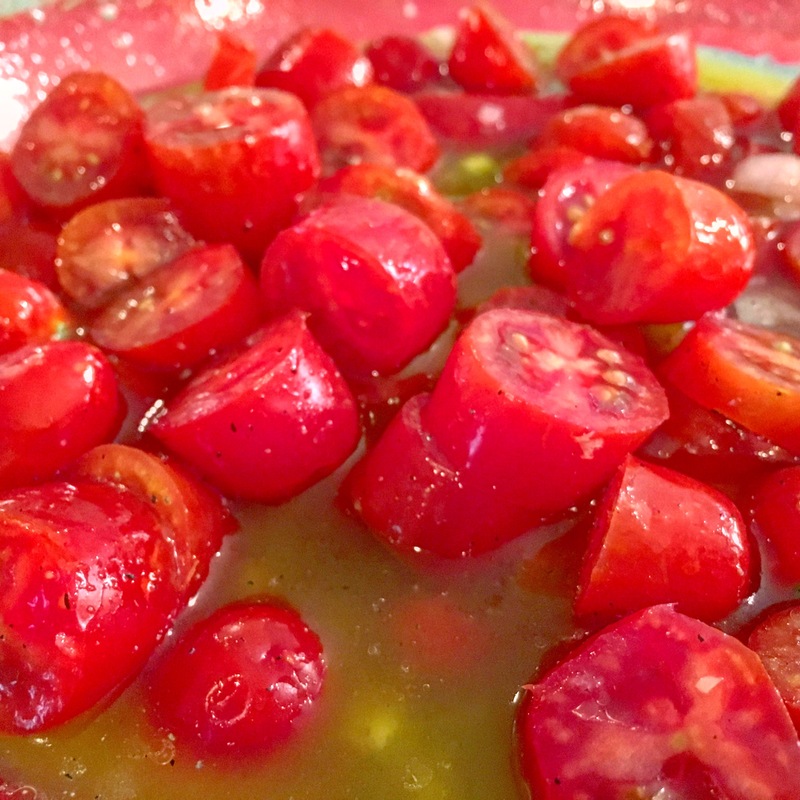 Pour the pasta into a large bowl and spoon the tomatoes mixture on top, then stir to combine. Add the mozzarella and basil, and season with salt and pepper if needed. Garnish with whole sprigs of basil. Serve hot or room temperature. Please let me know what you think of this recipe! Don’t hesitate to share with with your friends! *I was provided product and compensated for my post by Pasta Lensi. All opinions are authentically mine.